WAFFLES: Boss! I can FLY! I can FLY! KATIE: Waffles, you're laying down sideways on the blanket in our living room. I'd hardly consider that flying. WAFFLES: But look! My hat has wings!!! It's magic! KATIE: That's not a hat, Waffles. It's a habit. WAFFLES: A HABIT??? You mean like when you told me I had a chicken habit? KATIE: No Waffles. That's what the nun's wear. Their outfit is a habit. That so-called hat is part of their outfit. WAFFLES: So they must wear these habit things for flying, huh? I'm going to fly to California. I bet I can find a nice chicken ranch there. KATIE: Well good luck with that. Air travel just isn't what it used to be. WAFFLES: Ok, everybuddy, hats up in 60 seconds! I hope packed your wand toys! MIMI (left): This is embarrassing. I look like Yoda. How am I ever going to find a forever home with this crazy get up on? STORMY (right): Yeah well, I've got a wing span of about 5 feet. I'm never going to fit into the litter box again! WAFFLES: Look Boss! You're FLYING!!! KATIE: GET ME OUT OF THIS CRAZY HAT!!! WAFFLES: Uh, Boss? It's a habit. Our Saturday spoofs just got a whole lot furrier! Each week an adoptable cat (or cats!) from PAWS Pet Animal Welfare Society will be making a cameo appearance in our TV Trip blog series. Through the magic of Photoshop, they'll join Katie and Waffles in their TV time-travel adventures. 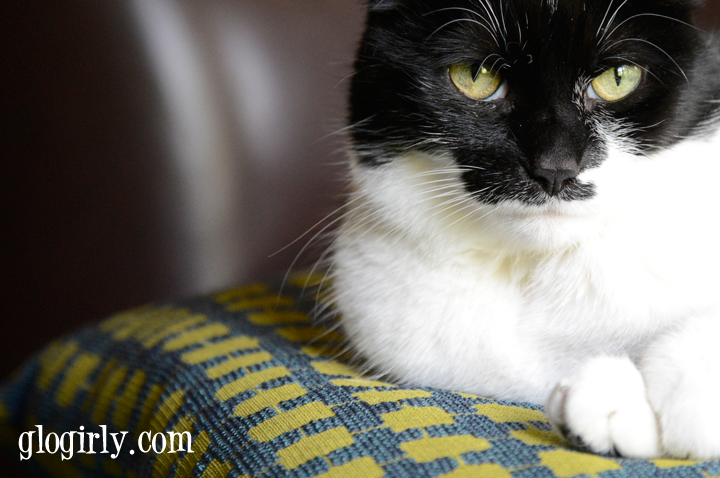 We'll also introduce you to the cameo cats and share a little bit about them. Maybe, just maybe... some silly wigs and special effects will help our shelter friends find forever homes. Stormy is a young torbie (tortoiseshell-tabby) cat with beautiful green eyes. She’s friendly to people and other cats. Her favorite hobbies are napping and sharing a couch with volunteers. Her roommate and buddy Mimi (tabby &white) has been at PAWS since last summer. During that time she's blossomed into an outgoing, curious girl cat. Both of these beautiful girls are available for adoption at PAWS, Pet Animal Welfare Society in Norwalk, Connecticut. Waffles, that habit looks like it was tailor-made for you! Now about that chicken ranch. Tell Glogirly to wikipedia that. Waffles, you crack me up! Your guest adoptables are such good sports for wearing those habits! You not only create magic - you show us lovely cats too. Man we would have an housefull by now. Hopefully by now you have landed in Californians and found your choken ranch. That hobbit looks pretty cute on you, but didn't your arme get tired of flapping? Hahaha!! Don't get in a flap, Katie!! Maggie does take brilliant photos of the sweet kitties. Very impressive. Let's hope this helps them to find homes soon! We hope those sweeties find their furever homes soon. Katie, how did Waffles get a crazy hat on you?!? Hope you find some chicken, Waffles! This is so much fun. I send Glogirly adorable adoptables and wait to see what she will do... Brilliant! Thank you for giving the PAWS cats more exposure. The Flying Nun was my favorite tv show oh so many years ago. It was one of the few shows my brothers and I watched with a female " super hero ". Now the super hero is Glogirly, with the help of her friend Maggie, making us laugh and helping the adoptable kitties find happy homes. That really is a super power. Very cute :) I hope Stormy and Mimi get a forever home together soon. Waffles do you sing too? Enjoy your Caturday. I think there are some great chickens closer than California. I'd start with a shorter flight! We sure hope Stormy & Mimi find someone to adopt them soon. Maybe they can find a furever home together. Come on, there must be someone in CT in need of the love & companionship of 2 such lovely lady cats. Every cat deserves a furever home & those kittys have been waiting a long time. 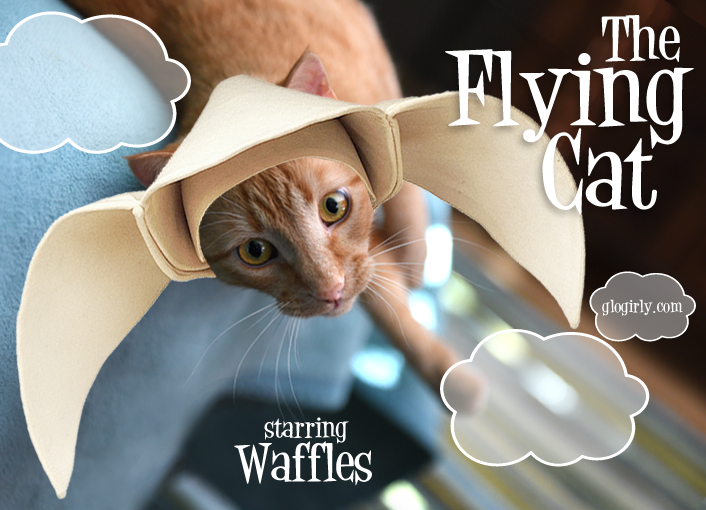 Be care with your magic flying habit Waffles. Our mom says she loves to eat chicken & waffles. Were sure she is talking about a different kind of waffles...at least we hope she is. Maybe Glogirly can show you some videos of The Flying Nun TV show. She had a magic habit & could fly around like magic too. MOl Mom remembers the Flying Nun! 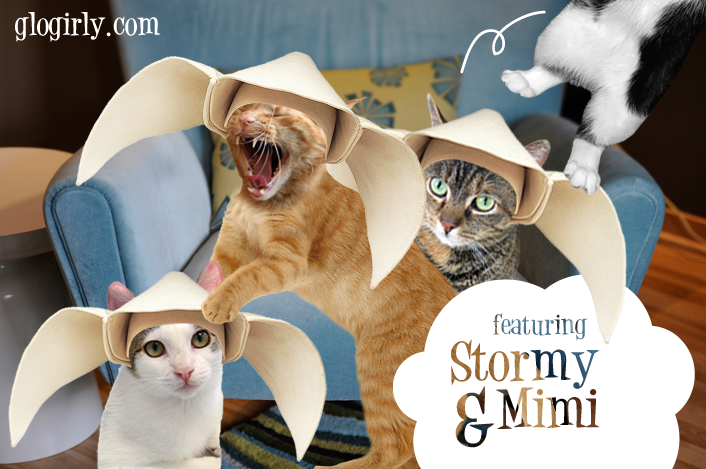 We think Stormy and Mimi look adorable!!! I thought you were grounded too, Katie. Grounded in reality. Those are habits. I thought nuns wore wimples or something. Anyhoo, they shouldn’t make a habit out of it. You should all fly over for a visit! 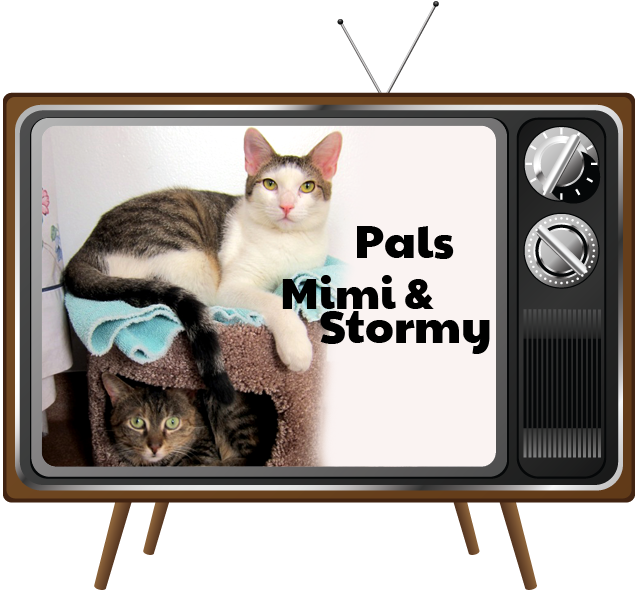 Tank you for featuring Mimi and Stormy; they are both such wonderful kitties! MOL! Of course this last line of Katie's also had us thinking of another old show..."Jane! STOP THIS CRAZY THING!" We love the chicken habit! Mumsy has been threatening to send our Domino to a chicken-addiction rehab place. He's got it bad.